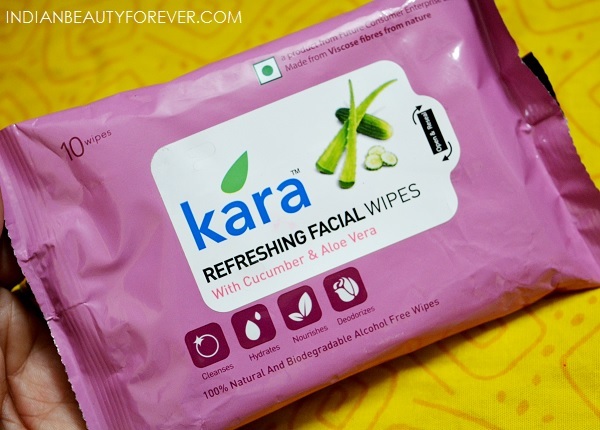 I will be reviewing Kara Facial wipes in this post. 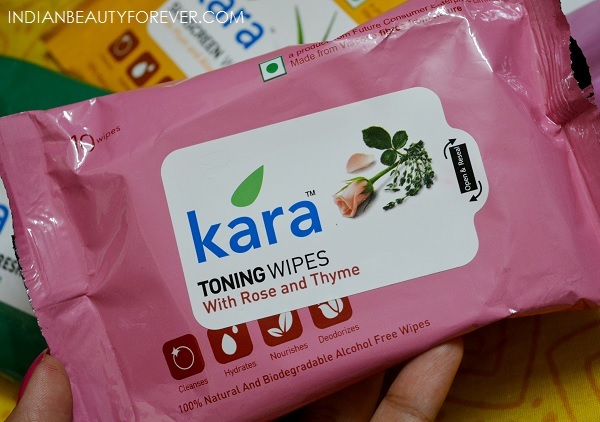 Kara wipes are not new to me since I have used couple of variants from Kara Face Wipes earlier as well. Actually Kara wipes are available in 8 variants. I have got 7 with me and I am going to review them. I have used the Kara Makeup-Removal Wipes already so, it’s okay. Let’s begin with these wipes. Actually these wipes are of 2 types mainly. They are available online - Nykaa.com and can also be purchased from BB, Health & Glow, Star Bazaar, Hypercity, Beauty stores, etc . Let’s get to know about them one by one. Each Kara wipe is made from Viscose fibres, a 100% natural bio-degradable fibre. It is pure, soft and has high moisture absorption capacity. Kara wipes are dermatologically tested. They are hygienic, skin-friendly and do not leave lint on the skin. Each formulation is a selective blend of aqua, skin-friendly ingredients and herbal actives with a precise functionality that results in a distinctly superior product experience on application. These are free from harsh chemicals like alcohol. These have to be my most favourite wipes since this has my 2 most favourite ingredients like neem and tea tree. They both are anti bacterial and are excellent to prevent the acne and pimples. The reason I also like them is that when I do not wish to wash my face with the regular face wash and water. I can simply remove the makeup and use this wipe and then proceed with my anti acne skin care for the night. 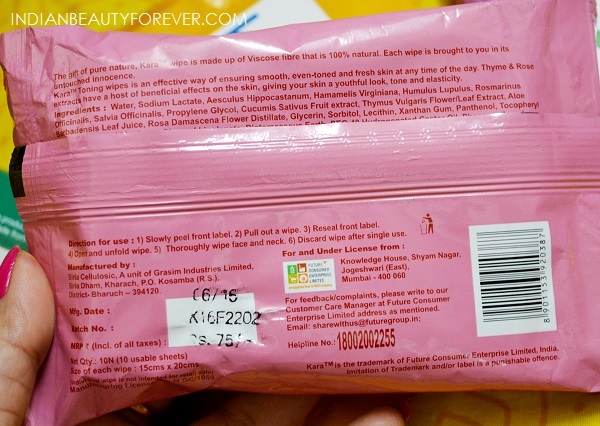 It cost 50 rupees for 10 wipes of this variant which is very cost effective. I can also carry them in my bag and use whenever I wish. 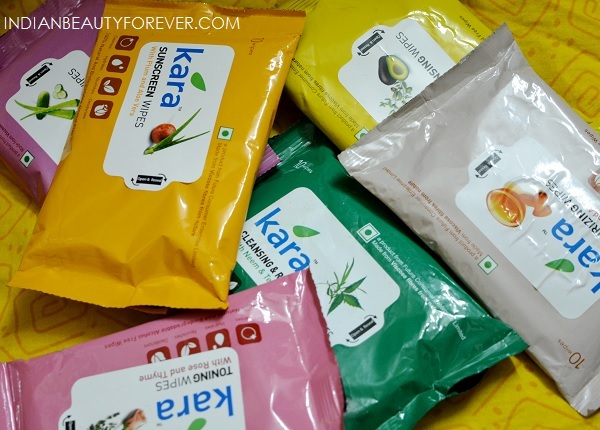 When you need to freshen up the complexion and get a nice feel then these Kara Refreshing Facial Wipes with Mint oil and Aloe Vera are just amazing. They can also be good for cane prone skin since aloe vera and mint both are good for oily acne prone skin. 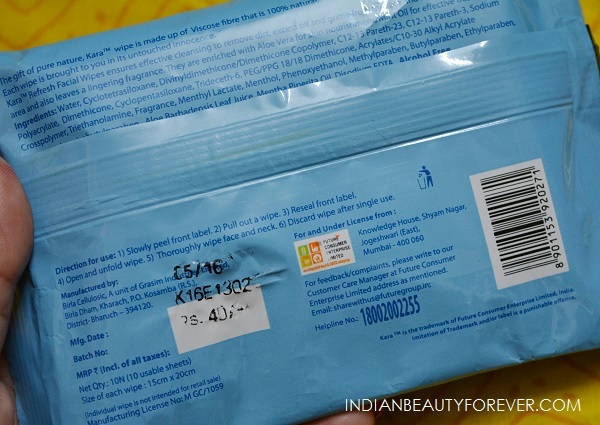 These wipes are for 40 rupees. Even cheaper than the neem wipes. They are ideal to get rid of the dirt, dust etc. 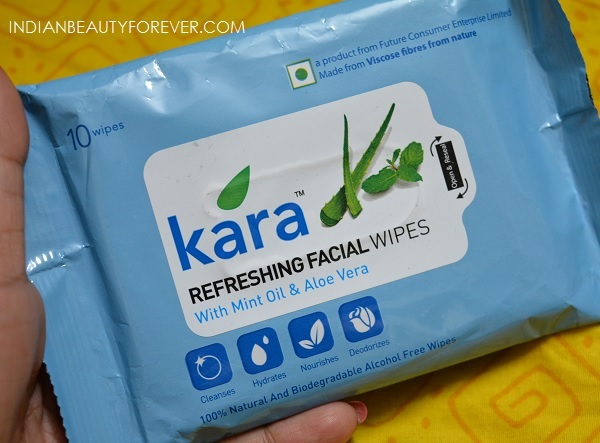 This was the first one from Kara Facial Wipes I had tried. If your skin is irritated and is very sensitive then these Kara Refreshing Facial Wipes with Mint oil and Aloe Vera will be perfect. My husband’s skin is getting sensitive these days and especially after the shave so, I gave him this and he really liked it. After a hectic tiring day when one just needs to cleanse the skin then wipes like these can be handy. These are also for 40 rupees for 10 wipes. I liked the smell of these wipes. They truly are very refreshing. These are also my most preferred wipes. I actually used this today itself mostly after coming home from outside when the face gets dirty with dust, oils and pollutants. I will use a cotton pad soaked up with my makeup remover and after that I used to wash the face earlier but now, I will just use this straight away and this really gives a cleansed skin than is free from dryness, oiliness or irritation. These are a little pricey for 75 rupees but worth it. I am also taking these with me when I travel. Rose and thyme are good to toning the skin Hence if you like to get the benefits of rose and thyme in a facial wipes then this can be used. 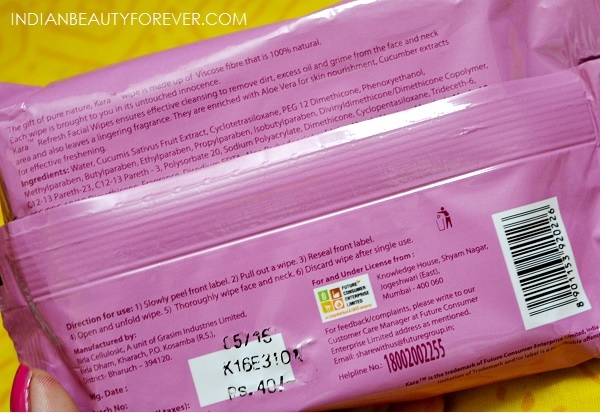 By the way, these wipes smell Divine due to the rose extracts. These can be used when you do not have to remove the makeup but would just like to have a clean fresh face after a hectic day at work or even after college. 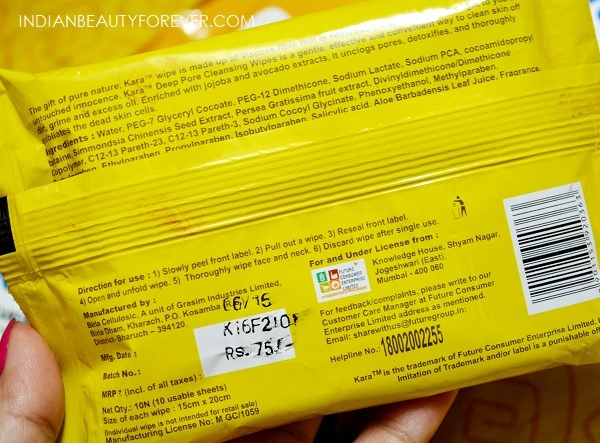 These wipes are for 75 rupees for 10 facial wipes. 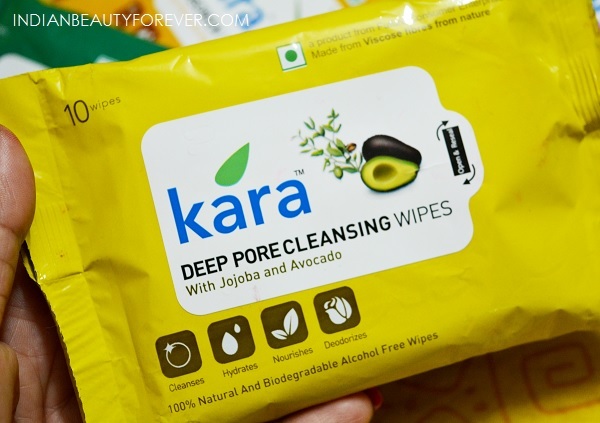 Like we have Kara wipes for oily acne prone skin and sensitive skin, here they also got facial wipes for dry skin. I have not used these but my mum who have dry skin, she used these. She said that these are good to get rid of the dirt, dust etc and to get a clean face without any dryness. The almond extracts along with honey moisturises the dry skin and keeps it supple. She is using this at night. 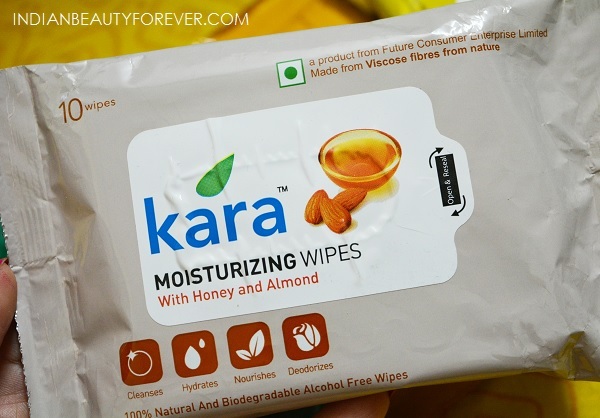 Kara Moisturizing Wipes with Honey and Almond cost 75 rupees for 01 wipes. These are very handy wipes to protect your skin against the harm of UV rays. I have already used these few months ago. 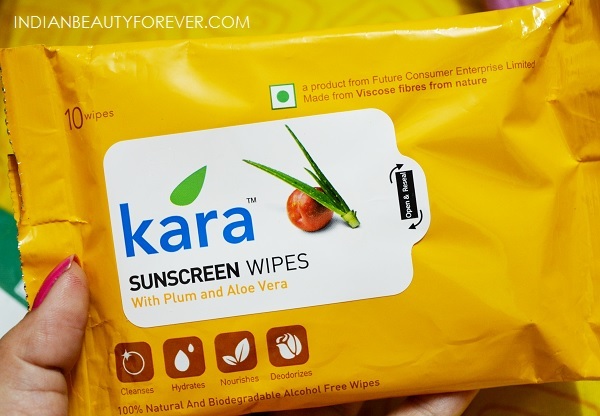 I liked that while I am travelling and its hot and humid outside, I can cleanse my skin with this wipe and after that I do not have to use sunscreen lotions, just wiping with these Kara Sunscreen Wipes will help to get a clean skin with sunscreen benefits. 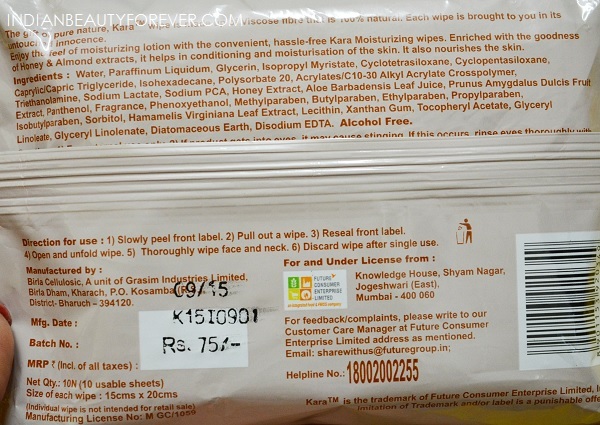 Kara Sunscreen Wipes costs 80 rupees for 10 wipes. This has SPF 20 and plum extracts along with the moisturising aloe vera. These facial wipes are of good enough size to cleanse the entire face and neck. These are not too wet which leaves the skin slimy or sticky. I really do not like the wet feel after the wipes. Men and women both can use them. They are very handy and can be carried in the bag purse, travel pouch etc. 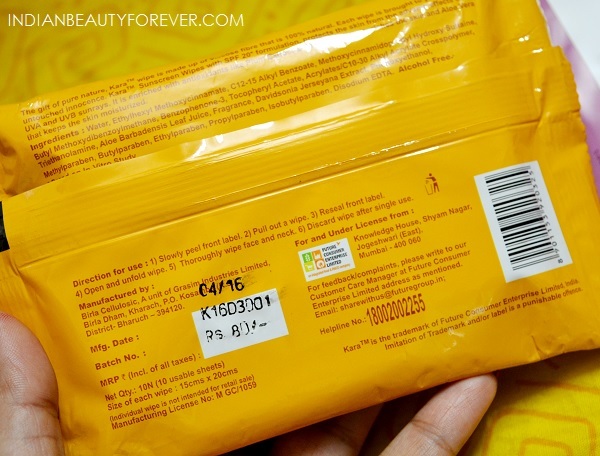 Usage is very simple, just peel the sticker half and take out the wipe then reseal for a fresh wipes even after weeks. 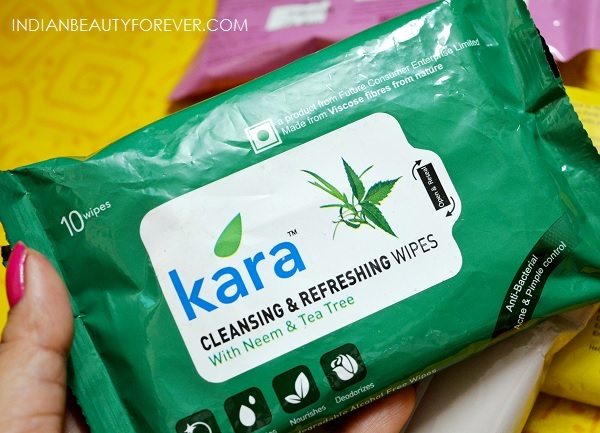 I loved these Kara wipes and honestly it was not my first brush up with these. And I am also sure that many of you girls must have used them, but after trying all the variants now, I can say that they are very handy and safe to be used. There are so many variants that one can have the one they need on the skin type and requirement. heard a lot about these.. gonna try these very soon..
Nice Review. These are worth trying. I've tried a couple of variants, while they didn't do anything amazing to my skin they do feel quite soft & gentle.